CEDAR CITY – Police are seeking a suspect involved in a credit union robbery Tuesday afternoon. At approximately 1:30 p.m., Cedar City Police responded to a robbery at Mountain America Credit Union, 1701 West Royal Hunte Drive. According to the Department’s press release, the suspect, an older white male, entered the bank and handed the teller a note demanding money. 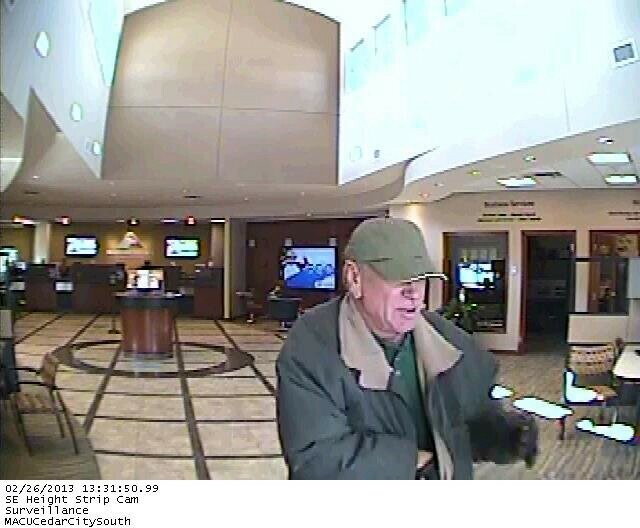 The suspect received an undisclosed amount of cash and left the bank. The Iron County School District was notified and placed the Cedar Middle School on lockdown as a precaution. The middle school is near the credit union. According to SUU News, Cedar Middle School is no longer on lockdown as of 3:30 p.m. The suspect was last seen wearing faded blue jeans, a green shirt, and a light green baseball style hat. He was also wearing a green coat with a tan collar. He is described as being in his 50s with gray hair. The investigation continues, however police are seeking assistance with identifying the suspect. Anyone with information is encouraged to contact the Cedar City Police Department at 435-586-2956.